I agree with Ben’s findings. 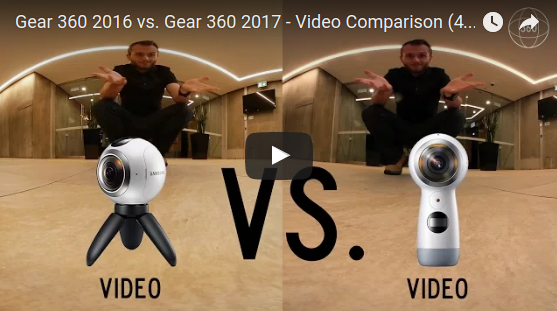 You can check out my comparison between the 2017 Gear 360 and original Gear 360 here. I also have an updated comparison here (comparing the original files). I will also be working on the mega-comparison (with twelve 360 cameras) as soon as I get the Xiaomi Mijia Sphere 360 (which should be arriving this week). So, did Samsung fixed overheating issue? Hi Den. For me, the 2017 has better overheating resistance than the original. But Aram Pan in Singapore said his 2017 is overheating after just 8 minutes (in 90F ambient). I just got the new gear 360 2017 and the overheating issue still there. At 28 celsius it records for about 5 minutes and then it stops recording. I use a Samsung EVO Plus micro SD card 128 Gb, reading 90 Mb and writing 20 Mb. Can it be the problem? I find it stupid that a camera like this, meant for outdoor main use maybe on a beach can not stand more than 28 celsius degrees. I just think I will send it back if I can not fix the overheating problem. Hands-On First Impressions of Xiaomi Mijia Mi Sphere 360 Camera: a Theta hunter?